Additional information kindly provided by Mrs. Iris Love and Mr. John Williams. NOTE. GRO = Gloucestershire Record Office. Re-erected 1730. In use 1922. Registers 1572-1986 lodged with GRO. [These registers may include those for St. Aldates's Church below]. situated between Finlay Rd. and Reservoir Rd. Built 1962-1964, to a futuristic design by Potter and Hare. Replaced a temporary wooden church which had been erected in 1928 and now used as a church hall. 2013. St Aldate’s Church has become a chapel-of-ease within the parish of St Oswald Coney Hill with St Aldate. St. Augustine's Catholic Church, Matson. Services were being held in a temporary building on the other side of Stroud Road in 1933, prior to construction of the Church. Church opened 1940. A church, built in early French Gothic style, was erected on the site in 1867-1869. Consecrated 1868. It was demolished in the late 1980's? Now the site of a car park. The site had been used for an earlier church belonging to the Priory of St. Oswold, and this church was demolished in 1645, at the time of the Great Rebellion. St. James Church, Upton St., opposite Clement St. Opened in 1841 as a chapel-at-ease of St. Michael's parish. The architect was Samuel Kempthorne. Lower Barton Ward 1902. Registers 1843-1975 lodged with GRO. St. James' Church, Quedgeley. Tower and South Aisle are 14th Century. The remainder was extensively restored in 1856-1857, virtually from the foundations, to the design of H. Woodyer. A war memorial commemorating those from Quedgeley is just inside the Church. Registers 1559-1974 are lodged with GRO, but a transcript of the Marriage Registers is available here. St. John's Church, Northgate St., on the corner of St. John's lane. A church is reputed to have existed on this site from 931. The church was rebuilt in the 11th century and dedicated to St. John the Baptist. The foundation stone for the present church was laid 1 June 1732, and the first service performed in 1734. The new church incorporated a 14th century tower and steeple from the old church. The spire was removed in 1910, and now resides in St. Lucy's garden, just around the corner from the church. 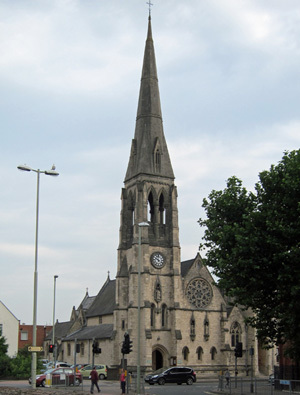 The church was renamed St. Johns Northgate in 1972 when the congregation entered into a sharing agreement with Northgate Methodist Chapel. Registers 1558-1974 lodged with GRO. St. Katharine's Church, Matson Lane, Matson. Registers 1553-1986 are lodged with GRO. A mural of Jesus healing the sick, was painted by Hugh ARNOLD in 1908 on the south wall of the chancel in the church. St. Lawrence Church, Barnwood. Norman church with a tower built in 1514. Charles WHEATSTONE, scientist and Edmund SAUNDERS, the Barnwood beggar who became Lord Chief Justice of England in 1683, were among those baptised in the 16th century font. Registers 1651-1959 are lodged with GRO. St. Luke's Methodist Chapel. See Stroud Rd. United Methodist Chapel. St. Margaret's Chapel, London Rd. The Chapel, previously dedicated to The Holy Sepulchre and known as St Sepulchre, was originally built for the benefit of those suffering from leprosy. 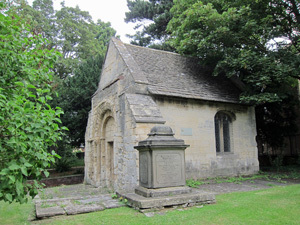 The present Chapel building is thought to date from the early 1400's but incorporates earlier masonry in the west wall. It was restored in 1846 and again in 1875 when the south vestry was added. Since 1934 the Gloucester Charities Trust have administered the Chapel. They appoint the Chaplain who at this time is full-time and also resident. Chapel services at St Margaret's are at present twice a month and are open to the public. The Registers for the years 1790-1845 have been preserved. St. Mary's Congregational Hall (Countess of Huntingdon Connexion), St. Mary's Square. The building was purchased in 1788 by the Countess of Huntingdon, having been previously used as a playhouse. Demolished 1958. St. Mary de Crypt Church, Southgate St. The site has housed a church from the 12th century, when it was known as the Church of the Blessed Mary within the Southgate. Also called Christ Church, and St. Mary in the South. Rebuilt and extended in the late 14th century, and again in the early 16th century. Robert Raikes (founder of Sunday School's), lies buried beneath the floor of the South Chapel. During the siege of Gloucester in 1643 the City used the church as a ammunition factory and store. Restored in 1844, architects Daukes & Hamilton. The pinnacles on the tower were removed in 1910. St. Mary de Lode Church, St. Mary's Square, Archdeacon St.
Also called St. Mary Before the Gate of St. Peter; St. Mary Broad Gate; and St. Mary De Port. Reputed to be the oldest parish church in Gloucester, dating back to the early 2nd century. During the civil war, in March 1643, and again in 1646, the church was used as a prison to hold some of the royalist soldiers captured by Sir William WALLER and Lieut. Col. Edward MASSEY. 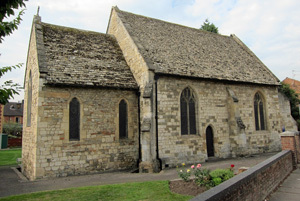 The chapel, belonging to the Augustinian House of Llanthony Secunda Priory, was built in the first half of the 12th century to serve the inmates of the leper hospital for women. Most of the chapel was taken down in 1861, due to its dangerous structural condition, so that only the chancel remains. It was restored in 1995, but is no longer in use as a place of worship. Sacred to the Memory of Robert Hopton, of the hamlet of Wotton, Yeoman, who departed this life March 20th. 1829 aged 76 years. Also of Frances, his second wife, who died July 26th 1832, aged 71 years. Also in memory of William Hopton, of Hardwick farm, Upton St. Leonards, son of Robert Hopton, who died September 1817 aged 27 years. Also of Sarah, his wife, who died September 28th. 1838 aged 54 years. 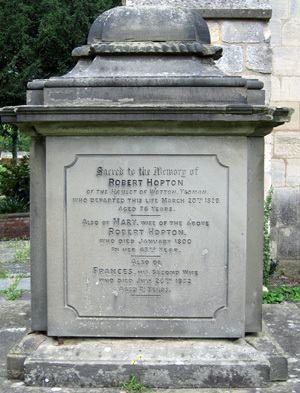 Also of Henry, son of Robert and Mary Hopton, who died April 3rd 1856 aged 61 years. Also of James, brother of the above, who died June 28th. 1860 aged 61 years. And of Margaret, wife of James Hopton, who died July 18th 1870 aged 75 Years. St Michael the Archangel church was in existence in the 12th century. 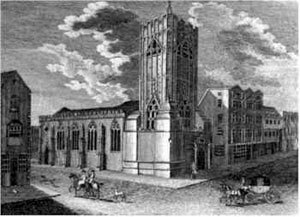 The old church, apart from the 15th century tower, was demolished in 1849 and a new church erected which incorporated the old tower. This church closed in 1940 when the parish combined with St. Mary de Crypt. In 1956 the church was demolished, leaving only the tower. A graveyard to the side of the church (behind the buildings in Southgate St.) is shown in a sketch in "An Original History of the City of Gloucester", by Thomas Dudley Fosbrooke, published in 1819. 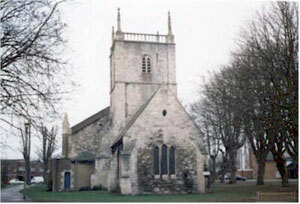 The parish was established before the 13th century, and by 1203 the church was called St. Nicholas of the Bridge at Gloucester. Rebuilt and enlarged in the 13th century, using pieces from the earlier church. The tower was built in the 15th century. Originally it had a spire over 200ft. in height. The spire was damaged during the siege of Gloucester in 1643, became unstable in 1783, and was shortened to about half its original height. It now (1998) has a distinct lean. In 1975 the St. Nicholas and neighbouring St. Mary de Lode congregation were joined and St. Nicholas church closed. It remains standing and in occasional use for exhibitions etc. Coney Hill Road GL4 4LX. Built in the 12th century. Situated in Southgate St., near corner with Commercial Rd., and opposite the old Hospital. Demolished before 1730, when Southgate Congregational Church was built on the site. The graveyard was incorporated in the North East corner of the docks development, building of which commenced 1794. It is thought that the graveyard included bodies from the nearby hospital as well as parishioners. The site of the burial ground is shown on a map of 1843, situated behind an independent church [Southgate Congregational Church], near the corner of Southgate St with the proposed Commercial Rd. Stroud Rd., junction with Parkend Rd. London Rd./Northgate St. GL1 3EX. Construction of the present church commenced in 1859, and it was consecrated 8 October 1868. It was built on the site of an earlier Catholic chapel which dated from the 1790's. Bristol Rd., at the junction with Linden Rd. The church was designed by W. Planck. A foundation stone at the rear of the church records that it was laid on 24 October 1898. At the front of the church, on the Linden Rd. side is a plaque which reads "This stone was unveiled on Palm Sunday April 13th 1930, recording the completion of the church." Registers 1896-1971 are lodged with GRO. On the rear wall of the church is a plaque commemorating the employees of S.J Moreland and Sons Ltd. who fought in the Great War. The church, built around 1450, replaced an earlier chapel. It has a Nave, with a low tower dividing the Nave from the Chancel. Registers 1558-1971 are lodged with GRO. Monumental Inscriptions War Memorial Inscription. Southgate St., close to the docks. In use 1902. Closed 1947. Stroud Rd, corner of Robinson Rd. Opened 1904 Became St. Luke's Methodist Chapel in 1955 when congregation united with those from Ryecroft Methodist Chapel. In use 1883, closed 1975. Painswick Rd., junction with Cemetery Rd. Opened 1887. Reopened in 1980 as Bethel African Episcopal church. Disused 1996. In use 1912. Used by Americans during World War 2. The Wesley Hall Congregation amalgamated with St. Luke's Methodist Chapel in 1965. Opened May 1872 and later renamed United Reform Church.